When the engineers at Canadian ISP Bell Canada asked us to create a web-based speed test, they set the bar high! Bell wanted to enable their customers to measure both internet and in-home performance. And with the SamKnows SDK already embedded into Bell’s CPE it was actually straightforward to build a web speed test that also measures Wi-Fi inside the home. Having automatically detected that you are a Bell customer, the web-based test actually runs two tests, not one. The second test measures the time it takes to send a signal from the user’s Bell modem to the internet. It’s the second stage here that’s really important for measuring in-home Wi-Fi. This second test eliminates all in-home factors, like an under-performing PC or a bad in-home Wi-Fi connection. In other words, if a user is experiencing slow internet speeds between their device and the internet (the first test) but has excellent internet speeds between the modem and the internet (the second test), then it is clear that the issue lies within the home. 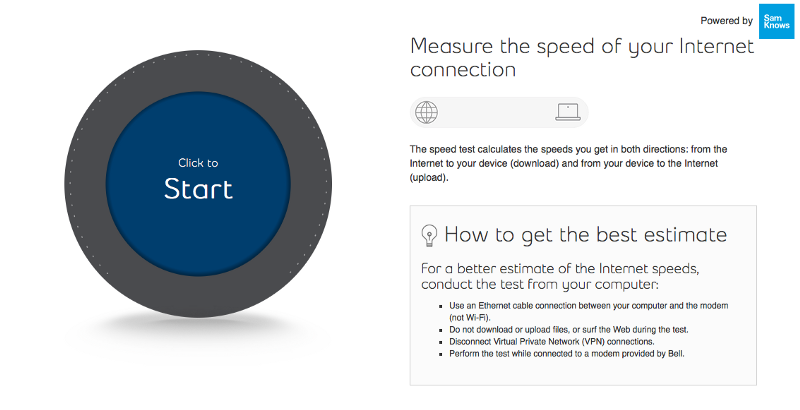 We love the Bell web-based speed test for two main reasons. It empowers Bell consumers by showing them what is affecting their internet speeds and is as accurate as a web-based speed test can possibly be. The test also enables Bell’s customer service to know whether there is an issue with Bell’s provisioning, and in turn this helps Bell to provide the best possible solution quickly and effectively. If you’re a Bell customer, you can find the test here. We hope you find it helpful! If you’re an ISP check out the SamKnows SDK today and help your customers solve their home Wi-Fi problems. Look out for a launch before 2017 that also measures in-home.